SSC CGL Syllabus 2018: Staff Selection Commission has announced notification of SSC CGL for the year of 2018 on 05th May 2018. We hope the news reached you and many of you started to apply for SSC CGL 2018. The SSC CGL notification against to fill up various Group “B” and Group “C” posts in various Ministries/ Departments/ Organisations. SSC CGL undergoes four different screening such as Tier I, Tier II, Tier III and Tier IV. According to the notification Tier I exams are going to conduct from 25th July – 20th Aug 2018. And the Tier II exam dates from 27th Nov to 30th Nov 2018. If you want to score high on SSC CGL examination for that you need to know the proper syllabus. This article fully compressed with all the subjects comes under SSC CGL Syllabus 2018 to enrich your marking and also exam dates are briefly explained. SSC CGL exam is for Group “B” and “C” category posts and also for various Government Ministries, Departments and Offices. Actually, the exam has four phase to clear that are Tier I, Tier II, Tier III, Tier IV examinations. The candidates should clear the four stages to get the job opportunity from SSC CGL. Initially, the two stages of the test will be based on online rest of two will be an offline exam. 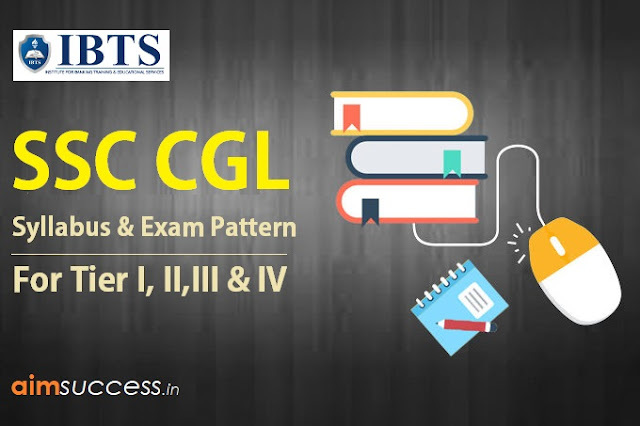 Candidates will have to undergo Four Tier Examinations based on the below-provided exam pattern to clear the SSC CGL Exam. Exam will also be based on the Computer Based Examination for Tier – II. Tier 1 – SSC CGL is an objective type online exam. There are 4 sections in it that are General Intelligence and Reasoning, General Awareness, Quantitative Aptitude, English Comprehension. Each section is carrying 25 questions. Totally SSC CGL Tier 1 holding 200 marks with the time duration of 60 Minutes. Clear details follow as below. It would include questions of both verbal and nonverbal type. This component may include questions on analogies, similarities and differences, space visualization, spatial orientation, problem-solving, analysis, judgment, decision making, visual memory, discrimination, observation, relationship concepts, arithmetical reasoning and figural classification, arithmetic number series, non-verbal series, coding and decoding, statement conclusion, syllogistic reasoning etc. The topics are, Semantic Analogy, Symbolic/ Number Analogy, Figural Analogy, Semantic Classification, Symbolic/ Number Classification, Figural Classification, Semantic Series, Number Series, Figural Series, Problem Solving, Word Building, Coding & de-coding, Numerical Operations, symbolic Operations, Trends, Space Orientation, Space Visualization, Venn Diagrams, Drawing inferences, Punched hole/ pattern- folding & unfolding, Figural Pattern- folding and completion, Indexing, Address matching, Date & city matching, Classification of centre codes/ roll numbers, Small & Capital letters/ numbers coding, decoding and classification, Embedded Figures, Critical thinking, Emotional Intelligence, Social Intelligence, Other sub-topics. Questions in this component will be aimed at testing the candidates‟ general awareness of the environment around him and its application to society. Questions will also be designed to test knowledge of current events and of such matters of every day observations and experience in their scientific aspect as may be expected of any educated person. The test will also include questions relating to India and its neighbouring countries especially pertaining History, Culture, Geography, Economic Scene, General Policy & Scientific Research. The questions will be designed to test the ability of appropriate use of numbers and number sense of the candidate. The scope of the test will be the computation of whole numbers, decimals, fractions and relationships between numbers, Percentage. Ratio & Proportion, Square roots, Averages, Interest, Profit and Loss, Discount, Partnership Business, Mixture and Alligation, Time and distance, Time & Work, Basic algebraic identities of School Algebra & Elementary surds, Graphs of Linear Equations, Triangle and its various kinds of centres, Congruence and similarity of triangles, Circle and its chords, tangents, angles subtended by chords of a circle, common tangents to two or more circles, Triangle, Quadrilaterals, Regular Polygons, Circle, Right Prism, Right Circular Cone, Right Circular Cylinder, Sphere, Hemispheres,Rectangular Parallelepiped, Regular Right Pyramid with triangular or square base,Trigonometric ratio, Degree and Radian Measures, Standard Identities, Complementary angles, Heights and Distances, Histogram, Frequency polygon, Bar diagram & Pie chart. Candidates ability to understand correct English, his/ her basic comprehension and writing ability, etc. would be tested. Negative marking is there for SSC CGL 2018 Tier 1 Exam. Each wrong answer leads to a penalty of 0.5 marks in all sections. Visually handicapped candidates can get extra timing 20 minutes. SSC CGL Tier II Exam Pattern – Detailed Description SSC tier II exam will be a computer-based online test totally for 200 marks. Questions will be asked from 3 sections namely Quantitative ability, Statistics with 100 questions and English section with 200 questions. 25 marks for each wrong answer in English Language & Comprehension paper. SSC CGL Tier 3 is descriptive type exam it is mainly designed to check the written skills and language proficiency of the applicants in English/Hindi. It is pen and paper mode and fully offline based. In this section, candidates should write Essay/Letter/Application/Precis. SSC CGL Tier 3 will be 60 minutes’ time duration with 100 marks. The Tier 4 of SSC CGL Exam 2018 has DEST and CPT test. DEST (Data Entry Speed Test): This test specially made to know the typing skill of the candidates to know their accuracy on the computer. With 15 minutes of time duration, the candidates should finish 2000 key depressions. CPT (Computer Proficiency Test): The CPT test compress with 3 different modules that are Word, Spread Sheet, and Generation of Slides, for some posts. The candidates need to clear the following post CSS (Assistant), Inspector (Preventive officer)[CBEC] & Inspector (Examiner)[CBEC], MEA(Assistant), Inspector (Central Excise) [CBEC].